Warehouse denim jumpsuit (sample, similar here), Patrizia Pepe cardigan (similar here), Mint Designs wool coat (I love this one too), Zara woollen hat and pointed-toe pumps (just seen here), Forever 21 geo rings, Zodiac necklace c/o Rebecca Minkoff, Alexander Mcqueen hobo bag. Shot by Kat Chang from Love and Ace. Every year fashion week seems to fly by, and for some reason this one came and went especially quickly. Blame it on the frigid cold, the multiple snow storms, the concurrent Olympic games, or whatever you want, but for some reason it was harder for me to get fully into the festivities this year. The day these photos were taken was a really fun one however, as I got to hang out with an old high school friend-turned-fellow-blogger, Kat from Love and Ace. I met up with her and her husband Ryan at Lincoln Center to snap a few pics before the Adeam show, then we grabbed a lunch together at the Smith and cocktails at an event hosted by Lulu's. I even convinced the cute couple to venture out to Brooklyn for the first time to hang out before they left. Success! Anyway, I owe them both a huge thank you as they braved the cold to take a few snaps of my look for me. 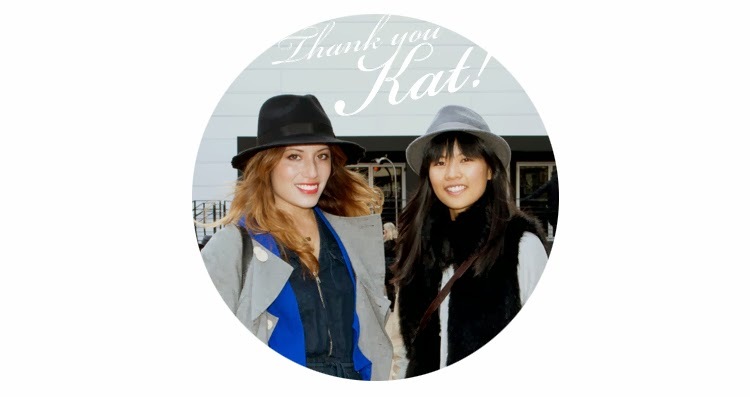 And definitely check out Kat's blog when you have a chance! I love her laid back, Californian style. jumpsuit or overall? love it, love it! Great jumpsuit and I love how you styled it. Great layering! Love the hat and all the pictures are great! You are so chic. LOVE the jumpsuit! Such a cute look! Loving that jumpsuit girly! Sounds like a fun reunion with your friend! Love those! that jumpsuit is just perfect!! What a small bloggie world! I love Kat from Love and Ace! Glad I found both of your blogs!!! Cute shoes b.t.w. I've never been drawn to jumpsuits, but this is a look I love!